Since we have entered the month of October I figured I would make all of the Mini of the Weeks feature something suitably creepy to help celebrate my favorite holiday, Halloween! 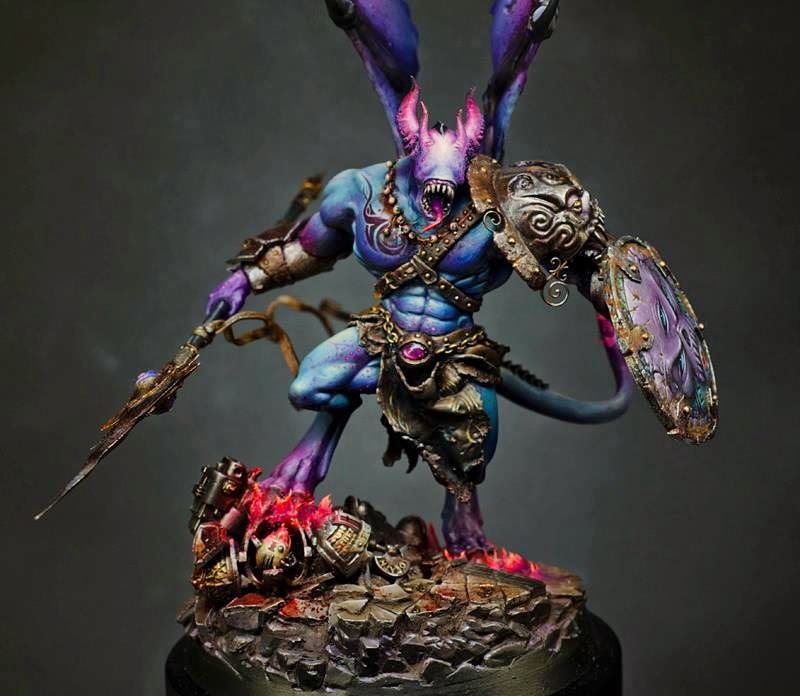 To kick things off I bring you this disturbing, yet beautiful Demon Prince of T'zeentch by Picster. The model is based off of the plastic Demon Prince, but it is so heavily converted you can hardly tell. Everything about it is done so gracefully you would almost think this was an original sculpt. To me, Chaos is at its best when it goes down the creepy route as opposed to the comic booky route it often takes. This guy, with his lack of eyes and lolling tongue, definitely fulfill that criteria. It truly looks like something from your worst nightmares made flesh. It ties itself quite firmly to 40k as well with the Grey Knight being immolated by ethereal flames under his foot. You know this demon must be powerful if even one of the Emperor's chosen can't withstand its touch. It's not just the superb sculpting work that makes this model though. The painting is also top notch, with nearly seamless blends and truly ethereal colors. The blues, purples and pinks really help to tie him to his patron god, no feathers and beaks for this guy. 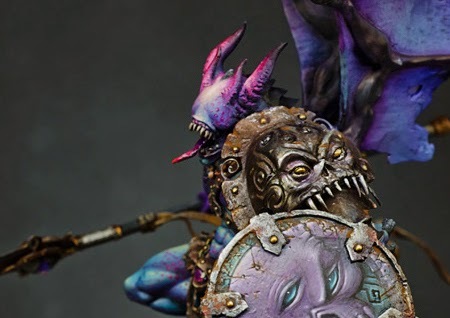 This model is truly terrifying and really exemplifies everything Chaos Demons should be. I hope we can see more stuff like this in the future.